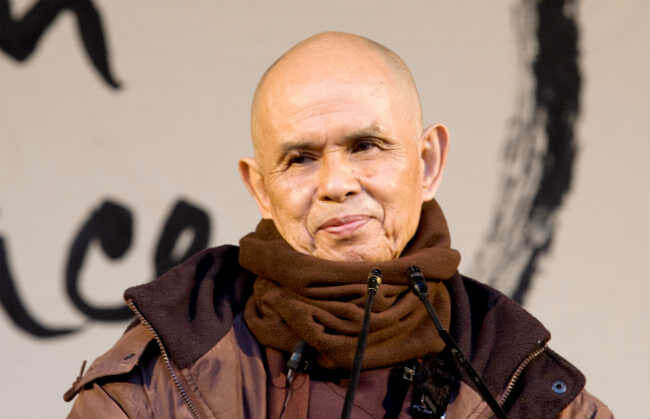 Thich Nhat Hanh (known as “Thay” by his students) is a Vietnamese Buddhist Zen Master, poet, author and peacemaker who was nominated by Dr Martin Luther King, Jr. for a Nobel Peace Prize in 1967. Born in central Vietnam in 1926, he became a monk at the age of 16. In 1966 at the age of 40, Thay was exiled from Vietnam because of his commitment to peace. The exile lasted 39 years. A model of “engaged Buddhism”, he now lives in Hue, Vietnam at his root temple (updates on Thay's health). Walk and touch peace in every moment. In the short video below Thay talks about the breath bringing us back to the present moment. December 17, 2009. New Hamlet. Plum Village. Thay tells the story of the beginnings of the Lieu Quán Dharma Line, of which Thich Nhat Hanh is the 8th generation of this Vietnamese branch. Our lineage is also traced to through the Lâm Te Dyana School (Linji), of which Thich Nhat Hanh is the 42nd generation. The talk begins with the gatha given to our main root teacher, Zen Master Lieu Quán (1670-1742), by Zen Master Tu Dung in Thuan Hóa, Vietnam in 1702. All phenomena rely on Oneness, what does Oneness rely on? Thay then traces all the teachers through the generations and how they each received their name from a gatha of Zen Master Lieu Quán. The classical Chinese characters of the gatha represent the name given to each of the generations. Is our true nature’s pure ocean. The source of Mind penetrates everywhere. From the roots of virtue springs the practice of compassion. The nature and function of all three are one. Can be realized by being wonderfully together. In order to reveal the true teaching! Wisdom and Action must go together. Students of Thich Nhat Hanh are encouraged to memorize this gatha.